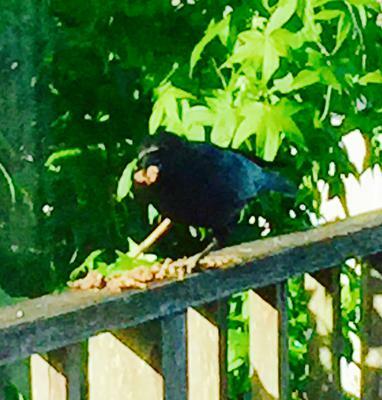 I am a back porch or really deck bird feeder. I live in Richmond Heights California. 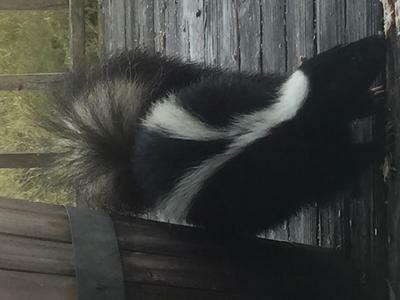 I feed a variety of birds, squirrels and at night raccoons, a skunk and opossums visit as well. Sunflower seeds are the common favorites of all our visitors; that and fresh water changed and refilled daily. It's surprising how much drinking and bathing takes place. When I think about it I wonder how everyone gets enough to drink considering how many small beasties visit on a regular basis and everyone baths with so much regularity I make sure the contain is cleaned every couple of days. 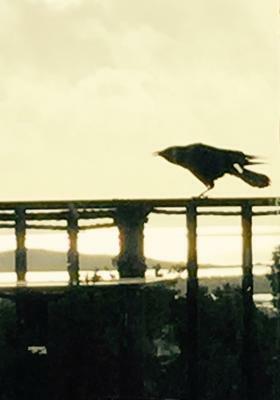 On my porch comes daily a small murder of crows as well. My favorite girl has had her below the bending joint talon eaten off. When she first arrived on our deck she looked terrible and after some three years now she is vibrant with a stronger remaining leg and her stump looks pretty good too. She has hatched another lovely girl who also visits with her mate and father. I feed them meat, eggs and nuts. They are all very wild, very shy and not at all inclined to become any friendlier that these acceptances plus the landing pad and fresh water. Last year I call her my girl, brought another wounded crow who came with her for awhile and she stood guard while the new girl ate but I haven't seen her for awhile; she had deformed or broken talons on both legs and rarely stood she looked tottery..something I'm sure that was attractive to the Coopers and other hawks who occasionally frequent the backyard and even the deck. Once a mom, dad and youth came testing to see who might become prey but the silence was so loud I came and watched them on the fence and trees until they left. When we changed our feed up a bit we lost all the little yellow finch looking birds that seed had shelled sunflowers. Once a fledgling came and begged it's parents so much that she was somehow left. She begged everyone who came to feed and ended up staying with us for while and accepted hand feeding. One day when she was being fed by my husband her mother or another landed on his big thumb and chirped a bunch and flew away the fledge took off and lived in the back yard for another six months before she moved with the flock when the feed changed. How I knew it was her for so long was she would linger and stay when I would bring out the food. She was a delight and I have this tiny video with she and I. These winged raptor people have become one of my life's joys. Why I write is to ask a question about the doves. 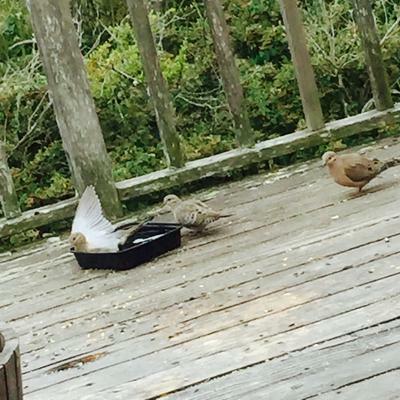 We have mourning doves a plenty and a bigger white dove couple that lives in our front tree. This morning a small rather well looking i.e. Not in molt yet, mourning dove was allowing a larger white dove to what I can only describe as cannabalistically pick at its feathers. It hunkered down as the white dove seemed to attack it. I rarely interfere although I know will receive criticism from some to feed anybody anything on my porch so I understand but I did go out a call them out. When the smaller dove flew away it landed next to the attacking dove like it was wanting to receive this. I don't understand and am asking for information on such behavior. Is it a suicide mission/calling or do birds of different species get help from one another? Hi.. I wish it were preening. The Doves were of different species and it looked very much like an attack. With feathers pulled out in chunks. I did do a little research after I posed my own question but the only answers I came up with were related to birds canabalizing each other that included chunks beyond feathers was where birds were caged. Some reasons for this behavior were mixed generations, small laying boxes and one interesting point was that if the pecking started and wasn't stopped the flock might peck itself to near and sometimes death because it somehow became a habit that was catchy. The only research was on caged birds. I'm thinking the doves were preening each other?